- This article was submitted by ICM.com. A moving average usually helps us detect the trend of the price of certain financial assets. However, prices usually fluctuate around the moving average. Whether you prefer breakout trading or sideways trading, price bands will support you in your journey. We will cover three technical analysis indicators that are used to quantify how much prices fluctuate near a certain moving average. Bollinger Bands, Keltner Channel, and Envelopes are among the most used trading tools. The upper and lower bands for the mentioned three indicators could be used as support and resistance. A trader could adjust the inputs of these indicators in order to suit his trading style. If the trader is trading the reversion to the mean, he will be using larger inputs. He will initiate sell positions near the upper band and buy positions near the lower band, as he believes that near these bands, the prices are extended. On the contrary, if a trader is looking for breakouts, he will be using smaller inputs to jump into trades at the earlier stages of an upcoming trend. The popular Bollinger band indicator was developed by John. A. Bollinger. It consists of a simple moving average and two standard deviations; one above and one below the moving average. The moving average is named as the middle band, the standard deviation above is called the upper band, and the standard deviation below is called the lower band. He used the standard deviation as it will give him a signal about the current market volatility. When the volatility is low, the bands get closer to the moving average which will give a signal to the trader that the market could be preparing for a move. On the other hand, when the bands are extremely far away from the moving average, it is a hint that the current market move is coming to an end. 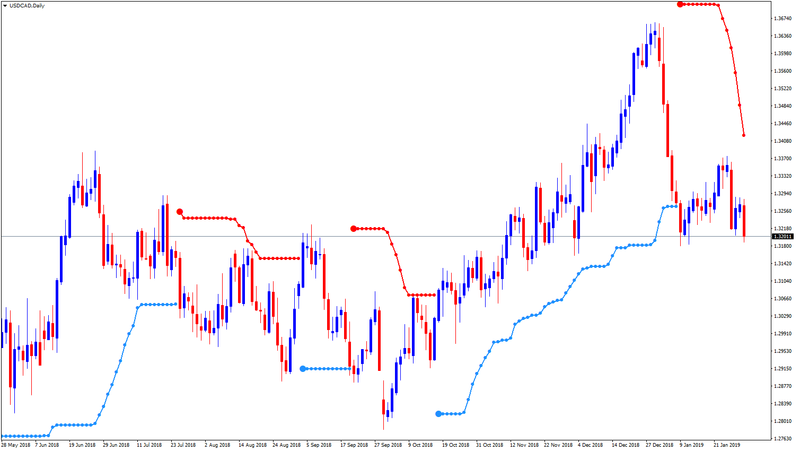 The below chart is the daily USDCAD chart with the regular inputs of the Bollinger band indicator (Moving average 20, Standard Deviation 2). The above chart sums up the benefits of the Bollinger band indicator. We can see that when the bands were getting closer to the moving average, we were preparing for a breakout (1), and when the bands were extremely far from the moving average, it gave the trader a signal that the current move is about to end (2). Moreover, the circles prove that the upper and lower bands are used as dynamic support and resistance. Even when the market was trending up, the pair was finding resistance near the upper band and was dropping back towards the moving average which acted as a support. Some breakout traders are now using a new version of the Bollinger band indicator, which only plots the minimum value of the standard deviation that is opposite to the current price direction. The above chart shows the same phase of the USDCAD pair, but with the new version of Bollinger bands that only draws the minimum deviation of the band opposite the price. In a trending market, the break of the upper band is usually considered as the break of resistance and the break of the lower band is usually considered as the break of support. Keltner Channel is another technical analysis indicator that is used to detect the range where the price fluctuates from the moving average. It consists of a moving average and upper and lower bands. The bands are formed by calculating the Average True Range of the same period of the moving average and adding above and below the moving average. Simply, if the 20-day simple moving average of the USDCAD pair is at 1.3288, the Average True Range of the last 20 days is 0.0081, and the multiplier is set at 1, then the upper band will be at 1.3369, and the lower band will be at 1.3207. If we are looking to trade reversals from overextended price moves, we should raise the multiplier to possibly detect the extremes and jump into trades. The above chart shows the USDCAD daily chart, with Keltner Channel using a 20-day simple moving average and multiplier 1 ATR. Such inputs could help a trader to enter breakout trades, but he should be using a proper stop loss and strict risk management. The above chart shows the USDCAD daily chart, with Keltner Channel using 20-day simple moving average and multiplier 3 ATR. Such input supported the trader in noticing overextended moves. It gives fewer signals but reduces the chances of defects. A moving average envelope is a technical indicator that uses a moving average with an upper and lower band. The upper band is formed by adding a specified percentage above the moving average, and the lower band is formed by adding the same specified percentage below the moving average. Simply, if the 20-day simple moving average of the USDCAD is at 1.3288, we add (1.3288*1%) above the moving average to obtain the upper band and we deduct (1.3288*1%) from the moving average to obtain the lower band. The interpretation is similar to the one of the Keltner Channel, if a trader is seeking breakout trades, he will use a smaller percentage, and if he is searching for the extremes, he should be using a larger percentage. The above chart shows the USDCAD daily chart, with a simple moving average envelope using 20 as period and 0.5% as a percentage. Such inputs will create numerous trade opportunities which will increase the chances of jumping into losing trades. The above chart is the USDCAD daily chart, with the moving average envelope using 20 as period and 2% as a percentage. The trader will be able to find price extremes and trade back to the mean. Finally, all the above-mentioned indicators are used for the same purposes. They can help us to detect when the market is less volatile and preparing for a breakout, and when the market is overextended. A trader must choose the input that suits his trading style. If he is aiming to find the overbought and oversold zone and trade the price back to the mean then he should be using higher standard deviation, ATR multiplier, or percentage. If a trader wants to scalp or even join an upcoming trend, he should use smaller inputs for the bands. However, a more sensitive indicator would create many trading signals but with smaller chances of success. Make sure you set the proper inputs that suit your trading style and always apply an appropriate strategy with strict risk management to accomplish better trading performance.